Crawley Town head coach Gabriele Cioffi is keen to turn good displays into points looking ahead to Reds’ two home games this week against Grimsby and Mansfield. On Saturday they host Grimsby Town who lie eight points and four places above Crawley in 14th place. 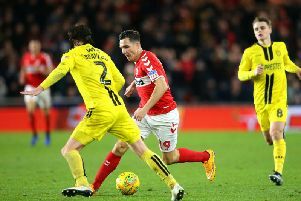 Their recent run five-game unbeaten run which comprised of four wins and a draw ended on Saturday with a 2-0 defeat at home to Cambridge United. Cioffi said: “We need points - the performance we had against MK Dons was brilliant but we didn’t collect points. “The priority now is points but when you perform then points are a consequence. “In the last 15 games we have had two flat performances, one against Port Vale and one against Macclesfield. Cioffi is aware of the threat of Grimsby’s top scorer and former Red Wes Thomas but is not planning to give him any special treatment.